Individual Game Tickets are available now at the TDECU Ticket Office located at Constellation Field, through Sugarlandskeeters.com, or by phone at 281-240-4487. Season tickets include all home games in 2019. Prices start at $677. The Sugar Land Skeeters strive to provide families, companies, and fans with the sweetest baseball experience in Texas! Whether you are building memories with your kids, entertaining your customers and employees, or watching some championship baseball--the best way to experience Skeeters baseball is as a season ticket holder. Skip waiting in line while still being able to take home authentic & limited 2019 Skeeters giveaways. Free with season tickets paid in full prior to December 14, 2018. Choose from one of four designs to personalize your seat for the 2019 season. Available as an add-on only for full season ticket holders (field box seats only). Save $600 on premium seating options! Imperial Box and Insperity Club tickets include a gourmet buffet during each game. Both options have dropped in price by 25% in 2019. Receive up to 36% off single game ticket pricing. Season Ticket Holders receive free parking passes good for each Skeeters game. Up to a $350 value. Rolling jackpot - $50 each night. Be in your seat to win. If there is not a winner, the money will roll over and grow the pot by $50 for the next game! Exclusive invitation to events throughout the season including Meet-N-Eats with the Skeeters players and coaches. Enjoy unique one-on-one opportunities like innings in the bullpen, dugout, or even join the radio broadcast for an inning! Receive first rights to playoff games and select special events throughout the year. 15-minute early entry using exclusive season ticket holder gate. Can't make it to a game? Don't worry! Enjoy the luxury of flexibility with our exchange and resale policies. Receive 10% off of every purchase in the Texas Direct Auto Buzzzz Shop. Get close to the action (and the great food). Our field box seating bowl area and includes Sections 1 -26. Every seat in the house has a great view of Sugar Land Skeeters baseball. Located directly behind home plate and in front of the press box the Diamond Deck allows you to enjoy the entire game from the comfort of a Leigh Country Furniture rocking chair. Some might say the seats are Rockin' (see how we did that?). Great seats with a great view of the game and you get to say you bought her a diamond all at the same time. The only way to get closer to the action is to get in the game. The Imperial Box is located in the first two rows between the dugouts and include wider, cushioned seats (cuz' your bum's worth it). Imperial Box season ticket holders also enjoy the dedicated season ticket holder entrance, VIP parking passes and you get access to the air conditioned Insperity Club, where gourmet dining packages are available. Great seats, A/C and great food. Doesn't get much better than that. Take in some great baseball and family fun from your premium seats behind home plate. Insperity Club Season Ticket holders get access to the air conditioned Insperity Club on the second deck of Constellation Field. Includes gourmet dining, which is included in the premium season tickets at no extra cost (excluding alcoholic beverages), features an extensive buffet with carving stations, salads, appetizers, entrees, special menus and desserts. In addition, popcorn, peanuts and non-alcoholic beverages are always available free of charge. The Pick 8 Plan gives you the power to choose any 8 home games to attend. For only $88, you'll be able to choose from any Field Box section and lock in your games and seat location. And don't worry, if something comes up and you need to switch games, you can do that with the Pick 8 Plan. Looking for some great baseball and family fun for the weekends? We have you covered. For only $88, the Saturday Night Plan allows you to enjoy Field Box tickets for 8 Saturday games. Games include: April 27, May 11, June 1, 15, July 13, August 17, 31, September 21. Our Fireworks Plan is great for the entire family. Fireworks, great baseball and family fun - doesn't get much better than that. For $88, you'll choose your Field Box seats for 8 games. Each game includes a fireworks display (and some great baseball). Games included: April 26, May 10, 17, June 14, 28, July 12, August 2, September 20. Our Atlantic League Plan allows you to see every team in the league! For just $88, enjoy eight games with each team in the Atlantic League. Games include: April 28, May 19, June 13, 29, July 14, August 22, 30, September 19. No need to use your muscles here! Flex Books are the perfect way to enjoy Skeeters games how you want, when you want. With a Flex Book, you get ten (10) undated Skeeters ticket vouchers that may be used for any 2019 Skeeters games of your choice to fit your schedule. Use two tickets for five games or all of them for one game--it's up to you! Flex Books give you the freedom to use your tickets however you'd like. Group hospitality at Skeeters Baseball Games is easy to plan, inexpensive and fun for everyone! We'd love to host any age birthday party, client or employee event or even a large-scale dining celebration. Our packages can accommodate any event that you have in mind. Live the suite life! Constellation Field's fully catered upper-level party suites are perfect for business hospitality or a personal celebration. Our climate-controlled party suites are ideal for entertaining clients, rewarding employees, networking or celebrating personal milestones. Looking to host your large-scale event at Constellation Field? We have year-round, full-service special event venue. The ballpark's multi-purpose design features a variety of dynamic settings accommodating intimate catered events to large-scale stadium seating for up to 5,000 for on-field events. Who doesn't like a picnic? In addition to having a great view of the field, this ticket includes a 2 hour, all you can eat BBQ themed buffet and access to the swimming pool that can be used throughout the game. The buffet begins an hour before the game and runs an hour into the game. Not available for every game. Celebrate your birthday at Constellation Field home of the 2016 Atlantic League Champion Sugar Land Skeeters. We have all sorts of packages for any type of birthday celebration, young or old. Contact us today and we will work with you to craft the perfect birthday celebration for you. Have a group that wants to come see some great baseball and have little fun too? We can help. One of our Ticketing Specialists can help craft the perfect plan for your group in one of our Field Box sections. Great seats. Great Baseball. And a whole lot of fun. Looking for a way to put the "fun" in fundraising? 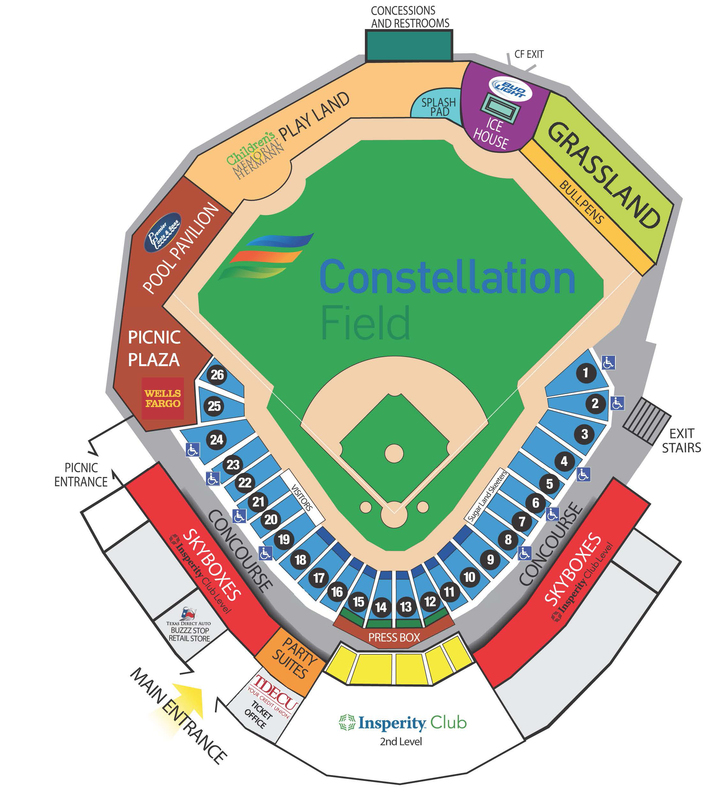 Raise money for your non-profit organization while enjoying a fun night out at Constellation Field watching the Sugar Land Skeeters play ball! All participating groups will receive a listing in the game program, a public announcement, group name on tickets and more! The Sugar Land Skeeters have created a special club for our young fans, ages 4-12! With two affordable memberships to choose from, we guarantee your child will make memories that will last a lifetime at Constellation Field. Membership includes tickets to every Sunday Funday game, front of the line for Kids Run the Bases, and many exclusive experiences! The "Silver Skeeters Club" provides a VIP package to allow seniors the opportunity to come out to Constellation Field and enjoy 11 games, including Opening Day, throughout the 2019 season. This VIP package is $35 and will include exclusive opportunities just for these club members such as "Baseball Bingo", a Silver Skeeters T-shirt, and access to Silver Skeeters VIP events.